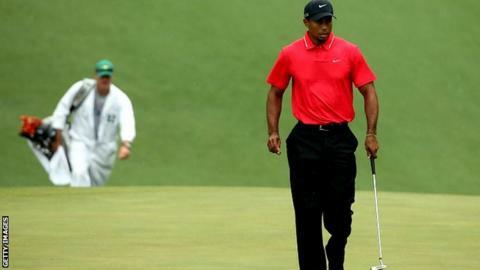 Jack Nicklaus still believes Tiger Woods will beat his record of 18 majors despite the latest injury setback that has caused the world number one to miss the Masters. Woods, 38, is absent from Augusta for the first time since his 1995 debut following back surgery. He has been stranded on 14 major titles since the 2008 US Open. "I still think he'll break my record. As long as he is physically able to do it," Nicklaus told ESPN Radio. "I feel very bad for Tiger, he has really worked towards the record." Woods has suffered numerous injuries over the years and has undergone four knee operations as well as having Achilles, neck and back problems. Many observers believe Woods's fitness regime and fondness for lifting heavy weights have contributed to his physical frailties. His latest surgery was to correct a pinched nerve. Woods's career also stalled in the aftermath of his infamous scandal and swing struggles after joining up with new coach Sean Foley in 2010. Sir Nick Faldo is adamant Woods will not get to 19 majors in his career. "If you want a yes or a no, it's a no," the Englishman told BBC Radio 5 live. "If he can get to 15 it will be his greatest golfing achievement, after going through all that. Time is flying. "It's six years since his last major, eight years since his last dominance and the last three years he has had some serious injuries to deal with. Mentally, it's hard. He's been a pro golfer for 20 years, that's a lot." However, Nicklaus, who won the last of his majors as a 46-year-old at Augusta, says Woods still has time on his side. "He's 38 years old and he's probably got another 10 years at least of being able to compete - that's 40 more majors to win five of them," he said. "It shouldn't be too difficult." At Woods's age, Nicklaus had also won 14 majors but he added the 1978 Open Championship later that year as a 38-year-old and won two majors at the age of 40 before his final win at Augusta. "It's tough right now, but I'm absolutely optimistic about the future," Woods said last week. "I've always said Jack reached his milestones over an entire career. I plan to have a lot of years left in mine."